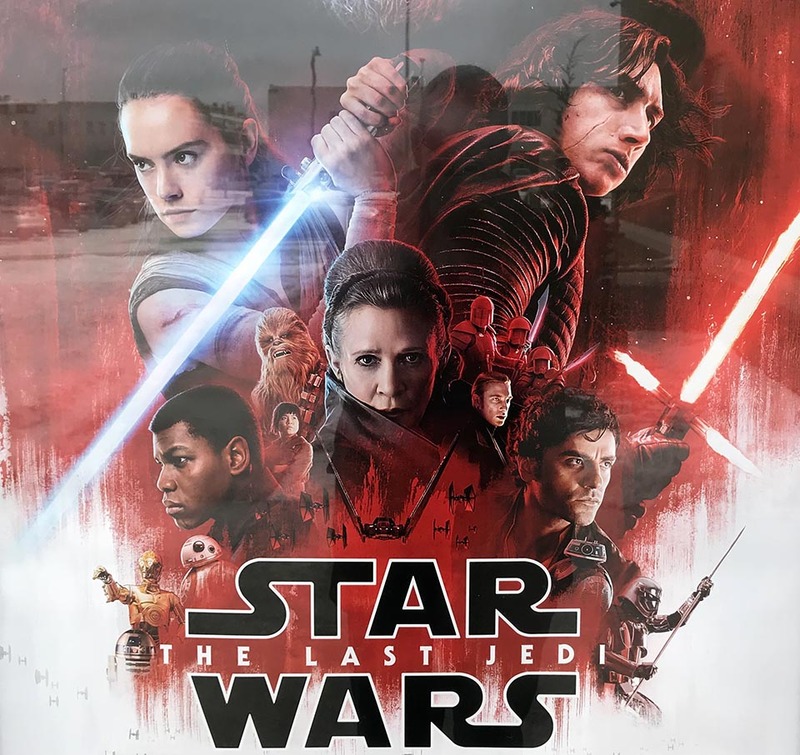 Star Wars: The Last Jedi is the eighth movie in the Star Wars saga franchise and the second movie in the trilogy. At the end of The Force Awakens, Rey (Daisy Ridley) left the rebel base with the map that leads to the missing Luke Skywalker (Mark Hamill). She was on a mission to bring him back to the Resistance and to his sister Leia Organa (Carrie Fisher). While on her mission, he turned to Luke to help her learn the ways of the Jedi force. Meanwhile, the Resistance evacuated their planet, and the looming threat of the First Order followed them close behind. Being a new fan to the Star Wars universe, I found that The Last Jedi was a great addition to the franchise, but I did have a few issues with the movie. There were scenes and plot choices made by director Rian Johnson that really pulled me in. A concept that I really enjoyed was Rey and Kylo Ren’s force connection. As their connection grew stronger throughout the movie, the two were able to get a better understanding of each other. I believe their relationship will play a huge part in Episode IX. I also enjoyed the scene in which the Battle of Crait took place. It kept me on the edge of my seat, anxious to know what would happen next. The biggest question everyone had after watching the previous movie was, “Who are Rey’s parents?” I, along with many other fans, went into this movie with my own theories on the question, and I have to say, I was disappointed with the outcome. The franchise kept this question in the air like a carrot on a stick, and I was dying to know the answer, but once I got my answer, I felt like throwing it back for a different one. It was unsatisfying and left me speechless. Another problem I had with this movie are the Canto Bight scenes in which Finn and Rose explored the casino. The film would have not been impacted at any point if these scenes were not in the movie. Other than introducing us to DJ, they served no other purpose. The reason Finn, Rose and BB-8 went to Canto Bight was to find the ‘Master Codebreaker,’ but they never actually got to him and settled with their next best option, which was DJ, who later turned out to be a major disappointment. I might have enjoyed Canto Bight more if the planet had served more purpose and meaning other than just being a sub-plot. In The Last Jedi, we got to see more from characters that did not get much screen time in The Force Awakens, like Luke Skywalker and Poe Dameron. Luke Skywalker is distinctly different in this installment of the franchise than in the past movies. We get to see what has become of him as he as aged, and we find out what he has been up to living on Ahch-To. We also get to know Poe more and how he fits into the Resistance. We were also introduced to new characters, like Rose Tico, the Resistance mechanic, and Admiral Amilyn Holdo. After being released on Dec. 15, 2017, The Last Jedi has received much praise and criticism, yet I personally loved this movie. The movie placed me on a roller coaster of excitement, joy, sadness and at times, even fear for these characters that I have grown to love. Once it was over, I could not stop thinking about it. I had so many questions, and I have to say I am thrilled and excited to see what is in store for the next movie.